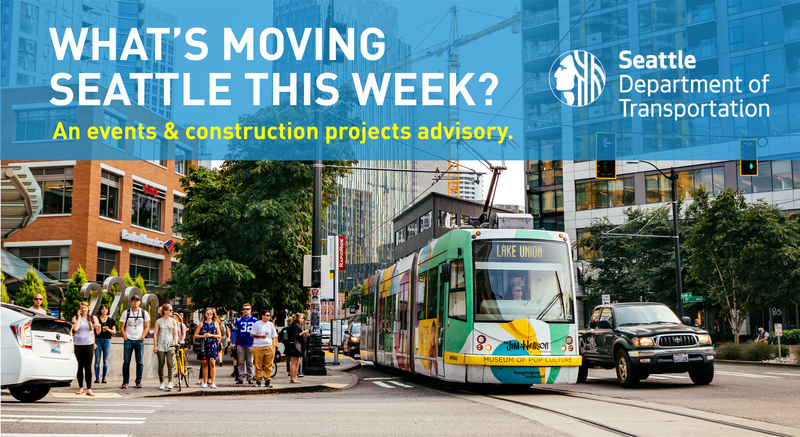 SDOT is advising travelers that lane closures on SW Barton St between 29th Ave SW and 30th Ave SW begin Saturday, May 19 through Wednesday, May 23. The closures are for concrete panel repairs on SW Barton St. This project is weather dependent. SDOT would like to thank the public for its patience while this work is being completed. SDOT is advising travelers of two overnight closures related to the 6th Ave Paving Project on Monday, May 21 and Tuesday, May 22. SDOT would like to thank the public for its patience while this work is being completed. SDOT is advising travelers of upcoming permanent changes related to the 7th Ave Mobility Improvements project beginning in the evening of Friday, May 18. 7th Ave will become one-way southbound permanently between Pine St and Olive Way to accommodate the new protected bike lane on 7th Ave.
SDOT is advising travelers to be aware of the following events happening around the city that may affect area traffic. The Mariners play tonight through Sunday at Safeco Field with a day games Wednesday and Sunday. The University District Street Fair is this weekend. WSDOT will lane and ramp closures through the weekend. Mariners vs. Texas Rangers: Seattle Mariners host the Rangers at 7:10 p.m. at Safeco Field. About 15,000 people are expected to attend. Mariners vs. Texas Rangers: Seattle Mariners host the Rangers at 12:40 p.m. at Safeco Field. About 23,000 people are expected to attend. Seattle 17th of May Festival: Annual Ballard neighborhood festival includes a parade celebrating Norway’s Constitution Day. The festival starts at 10 a.m., the parade goes from 6 p.m. to 9 p.m. About 4,000 people are expected to attend. Mariners vs. Detroit Tigers: Seattle Mariners host the Tigers at 7:10 p.m. at Safeco Field. About 15,000 people are expected to attend. F5 Bike Everywhere Day: Event to celebrate and encourage bicycling as transportation, begins at 6 a.m. Celebration stations will be set up along major travel routes throughout the city. Mariners vs. Detroit Tigers: Seattle Mariners host the Tigers at 7:10 p.m. at Safeco Field. About 31,000 people are expected to attend. Paul Simon Concert: The Homeward Bound Farewell tour show at KeyArena starts at 8 p.m. About 12,000 people are expected to attend. University District Street Fair: The 49th annual arts and music fair on University Wy NE between NE Campus Parkway and NE 50th St. Event hours are 10 a.m. to 7 p.m. NE 42nd, NE 43rd and NE 47th streets are closed from Brooklyn Ave NE to 15th Ave NE. About 20,000 people are expected to attend each day. Mariners vs. Detroit Tigers: Seattle Mariners host the Tigers at 7:10 p.m. at Safeco Field. About 32,000 people are expected to attend. Stars on Ice: At KeyArena features U.S Figure Skating team members. The show starts at 7:30 p.m. About 4,000 people are expected to attend. Nordstrom Beat the Bridge 8K Run and Walk: The annual fundraiser for the Juvenile Diabetes Research Foundation run starts and finishes at Husky Stadium and crosses the University Bridge. Montlake Boulevard closes to all vehicle traffic at 7:30 a.m. The 8K starts at 8:30 a.m. Here’s a link to the course map. About 11,000 people are expected to participate. West Seattle 5K Run/Walk: The fundraising event for West Seattle High School will take place along Alki Ave SW starting at 9:20 a.m. About 1,400 people are expected to participate. University District Street Fair: The 49th annual arts and music fair on University Wy NE between NE Campus Parkway and NE 50th St. About 20,000 people are expected to attend. Spring Opener: The Georgetown Car and Bike show fundraiser for Treehouse goes from 12 p.m. to 5 p.m. on Airport Way between Corson Ave S and S Bailey St. About 500 people are expected to attend. Mariners vs. Detroit Tigers: Seattle Mariners host the Tigers at 1:10 p.m. at Safeco Field. About 35,000 people are expected to attend. Two lanes of northbound I-5 will remain open between the West Seattle Bridge and SR 520 from 7 a.m. to 11 p.m. daily. SDOT is advising travelers that Columbia St will be reduced to one travel lane between 1st and 3rd avenues on Tuesday, May 15, between 9 a.m. and 3 p.m. and on Saturday, May 19, between 8 a.m. and 6 p.m. as work on the Columbia St 2-way Transit Corridor Project continues. SDOT would like to thank the public for its patience while this work is completed. If you have questions or concerns, please contact the Columbia 2-Way Project team at columbia@seattle.gov, or (206) 316-2545. SDOT is advising travelers to be aware of the following events happening around the city that may affect area traffic. The Color Run is Sunday starts and finishes at Seattle Center and takes runners through downtown. WSDOT has weekend closures that include the northbound I-5 off-ramp to West Seattle Bridge/Spokane St/Columbian Way beginning 8 p.m. Friday. Madrona Mayfair: The annual community parade runs from 9:30 a.m. to 1 p.m. at Alvin Larkins Park 3400 E Pike St to Madrona Playground. About 420 people are expected to attend. SODO Flea: Monthly flea market runs from 10 a.m. to 4 p.m. on Utah Ave S between S Stacy and S Holgate streets. Utah Ave S is closed from 6 p.m. to 6 p.m. About 1,000 people are expected to attend. Seven Lions Concert: At WaMu Theater from 6 p.m. to 10 p.m. About 7,000 people are expected to attend. The Color Run: The run starts at Seattle Center to downtown and back at 8 a.m. The route starts on Mercer St at 3rd Ave N, east on Mercer St, south on 4th Ave N, east on Republican St, south on 5th Ave N, south on Cedar St, south on 4th Ave to Seneca St, U-turn, north on 4th Ave, west on Denny Way, north on 2nd Ave N onto the Seattle Center campus. All streets are expected to be reopened by 12 p.m. About 10,000 are expected to participate. P!nk concert: Pink performs at KeyArena, the Beautiful Trauma World tour show runs from 7:30 p.m. to 11 p.m. About 12,000 are expected to attend. WSDOT will reduce northbound I-5 to two lanes near Michigan St at 8 p.m. Friday, May 11, and will wrap up by 5 a.m. Monday, May 14. Northbound I-5 will be reduced to two lanes between the West Seattle Bridge and downtown.